Cold Water Survival Videos - Even on the warmest days of Summer the Yukon lakes are cold, very cold. I've put together this page to help educate people on the dangers associated with cold water and what to do in an emergency to help you survive. Dr. Giesbrecht operates the Laboratory for Exercise and Environmental Medicine where he studies human responses to exercise/work in extreme environments. He has conducted hundreds of cold water immersion studies that have provided valuable information about cold stress physiology and pre-hospital care for human hypothermia. 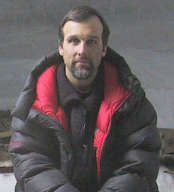 The following cold water Survival videos about falling through ice, from Discovery Channel Canada, were supplied by Dr. Giesbrecht. If you plan to travel the lakes of the Yukon or any other cold-water lakes please take a moment to watch these videos, they could save your life or the life of someone close to you. Keep in mind that although these survival videos demonstrate survival after falling through the ice into cold water, many of the same principals of survival apply during the summer months as well. If you end up in a cold-water lake, remember that hypothermia can be deadly, so take the appropriate steps to keep yourself and others alive. I would like to say thank you to Dr. Giesbrecht for taking the time to study, learn, and share such valuable information that has no doubt saved lives. How to survive hypothermia as a result of falling into cold water is a lesson that everyone should learn, and without Dr. Giesbrecht's work in this area we may not know as much as we do now... Thanks Doctor! Notice: These Videos were supplied by and used with the permission of Dr. Gordon Giesbrecht. They remain the property of the Discovery Channel Canada and as such are Copyrighted. They are posted here for educational purposes only and are not to be reproduced or copied in any way.